Of course she is known as the Queen of dance and once more Madhuri Dixit proves her amazing dance expertise that with her incredible performance in the song ‘Tabaah Ho Gaye’ from Kalank. Every movement is beautiful and you sit in awe watching this incredible piece. We have to say this one, and we have only seen 2-minutes, is going to go down on the list of the all time greatest dance pieces. But we gush! The gorgeous song is composed by Pritam and sung brilliantly by the always fabulous Shreya Ghosal. The piece is choreographed by Saroj Khan and Remo D’Souza. When we asked Remo D’Souza about this mindblowing number yesterday he talked about working with the incredible Saroj Khan and Madhuri Dixit. Of course, he says it was an amazing experience. 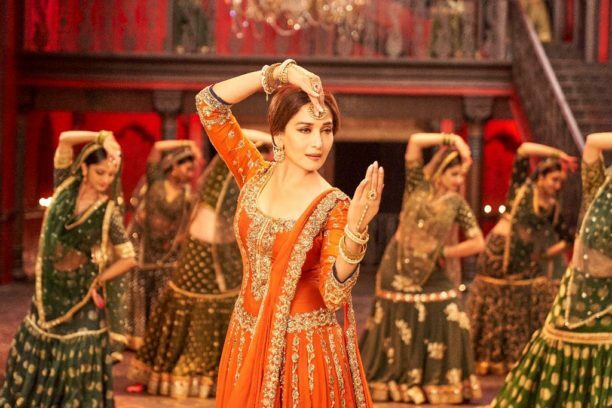 However, you have to wait for what he had to say until our exclusive interview about all the dances of Kalank comes out soon! Directed by Abhishek Varman and also starring Alia Bhatt, Varun Dhawan, Sonakshi Sinha, Aditya Roy Kapur and Sanjay Dutt the film releases on April 17th! We can’t wait to see this come alive on-screen! 16 queries in 0.339 seconds.